Our 60g protein yield is 100% sourced from only the very best protein source – pure milk exclusively from U.S. dairy farmers. Our CARBPLEX carb blend has been improved to add healthier, long chain, complex carbs and it now has 60% less sugar. Even our absorption complex has been upgraded to improve absorption. While we were at it, we created the 5 best tasting flavors you’ll ever get in a mass gainer. QUICKMASS – a truly superior mass gainer, in every way. How does Quickmass help pack on size? Gains like you've never tasted before! Best of all, YOU DON’T NEED TO ADD MILK! That’s right, while other products add calories that come from milk, QUICKMASS is PERFECT with just water! Milk is expensive. Don’t settle for a mass gainer that doesn’t mix with clean, cold, refreshing water. QUICKMASS comes in 5 amazing flavors: Chocolate, Vanilla, Chocolate Peanut Butter, Cookies and Cream, and Strawberry-Banana. 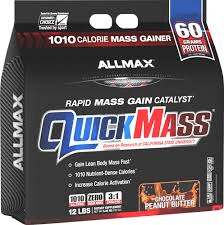 ALLMAX QUICKMASS is available in a NEW 12 lb Bag. Every ingredient added and every lot produced is laboratory-tested for purity and potency to ensure consistent product quality and integrity every time, guaranteed. QUICKMASS goes through the exclusive ALLMAX 5-Stage Quality Testing protocol.